When Jesus and his disciples are said to be in the world but not of the world, the meaning is clear enough. Although they live in the world they are not worldly, they do not subscribe to the present values and standards of the world. Albert Nolan, O.P. (born 1934) is a Roman Catholic priest and member of the Dominican Order in South Africa. The sinners would have included those who did not pay their tithes (one tenth of their income) to the priests, and those who were negligent about the sabbath rest and about ritual cleanliness. The laws and customs on these matters were so complicated that the uneducated were quite incapable of understanding what was expected of them. Education in those days was a matter of knowing .. the law and all its ramifications. The illiterate and uneducated were inevitably lawless and immoral. The ‘am ha-arez, or uneducated peasants, ‘the rabble who know nothing of the law’ (John 7:49) were regarded by even the most enlightened Pharisees, like Hillel, as incapable of virtue and piety. The sinners … had been taught to think of sin as the failure of observe laws of which they were usually quite ignorant. Sin was therefore not always a fully deliberate act. 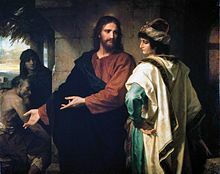 The remarkable thing about Jesus was that, although he came from the middle class and had no appreciable disadvantages himself, he mixed socially with the lowest of the low and identified himself with them. He became an outcast by choice. Why did Jesus do this? What would make a middle-class man talk to beggars and mix socially with the poor? What would make a prophet associate with the rabble who know nothing of the law? The answer comes across very clearly in the gospels: compassion. Rejoicing and celebrating with sinners was incomprehensibly scandalous (Luke 15:1). They [the Pharisees] could only assume that he [Jesus] had become a pleasure-seeker, “a drunkard and a glutton” (Luke 7:34). There can be no doubt that Jesus was a remarkably cheerful person and that his joy, like his faith and hope, was infectious. This was in fact the most characteristic and most noticeable difference between Jesus and John. As we shall see later, Jesus feasted while John fasted (Luke 7:31-34). The Christian belief in heaven originated after the death of Jesus with the idea that he had been taken up into heaven or exalted to the right hand of God. “Those who humble themselves will be exalted” is not a promise of future prestige to those who have no prestige now or to those who have given up all reliance upon prestige. It is the promise that they will no longer be treated as inferior but will receive full recognition as human beings. Just as the poor are not promised wealth but the satisfaction of their needs — no one shall want; so the little ones are not promised status and prestige but the full recognition of their dignity as human beings. The leaders and scholars of Jesus’ time had first enslaved themselves to the law. This not only enhanced their prestige in society, it also gave them a sense of security. Man fears the responsibility of being free. It is often easier to let others make the decisions or to rely upon the letter of the law. Some men want to be slaves. After enslaving themselves to the letter of the law, such men always go on to deny freedom to others. They will not rest until they have imposed the same oppressive burdens upon everyone (Matt 23:4,15).